This month, we’re celebrating the Hänel Rotomat; a machine that’s been around since 1957, proudly standing at the forefront of storage technology for over 70 years. Of course, it’s come a long way since it was first developed; originally based on the Ferris wheel principle, it is now powered by one or two 400 volt three-phase motors (single phase available), and the powerful Hänel microprocessor control units offer the possibility of connecting to bespoke IT systems and external devices. It can store anything from heavy tooling to personal files; when it comes to automated storage, the Rotomat really is an all-rounder! Developed in Germany, it’s success globally has been driven by the electronics, automotive and tooling industries, industries that all have different storage requirements, and most importantly, have very different products. 1. ESD storage possibilities: Hänel offers it’s Rotomat storage carousels with a conductive work counter, multi-function carriers with an anti-static coating and mechanical systems in a special Electro Static Discharge (ESD) design. 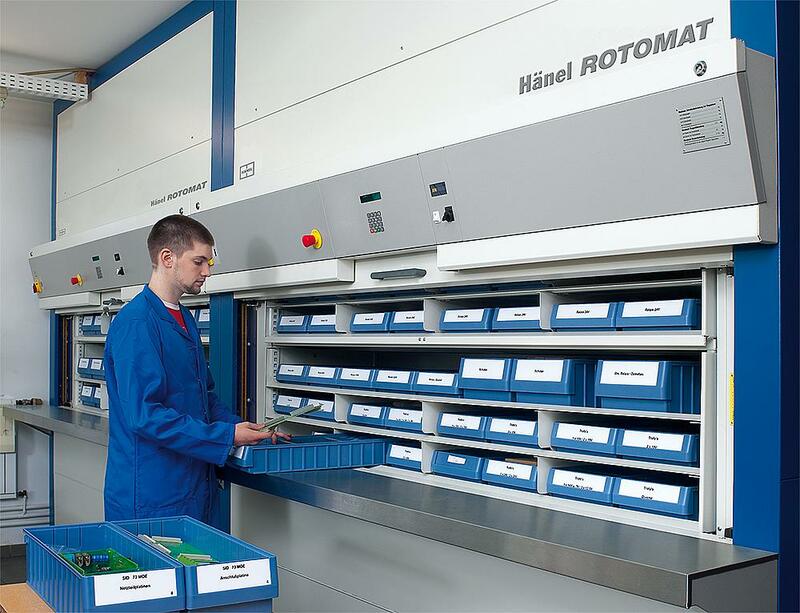 What makes this even better is the Rotomat can also be combined with systems like Hänel ClimateStore or CleanStore, for the storage of hyper-sensitive, electronic components. 2. Flexible storage capacity: With intermediate shelves, the Hänel MFPS1 positioning system can change the amount of storage levels to suit product size and volume of goods. Hänel knows the electronics industry is constantly changing it’s products, which is why they’ve designed the Rotomat to adapt to them too. 3. Integration with IT systems: With part assembly being so varied in the electronics industry, it’s crucial that an efficient solution is integrated without major disruption. Hänel provide software that allows you to integrate with SAP to transfer orders via a SOAP XML interface to the Hänel systems. This means electrical components can be stored in the Rotomat, even if they are required for post-series production. 4. Eco Design: The effective energy consumption of automated storage and retrieval systems has a major impact on operating costs and critically on environmental protection. For this reason, Hänel has always placed great emphasis on continually optimising the energy efficiency of its storage systems. Using the Hänel EcoLoad system ensures weight distribution of the electronic components stored inside the Rotomat is balanced, and because of this, very little energy is required for a rotation or travel. 5. Lead Time: Busy industries, such as electronics, are used to working fast and Hänel’s Rotomat comes with a very swift lead time – making this the machine for those who need a quick, efficient and reliable solution! If you would like to hear more about the Rotomat, call our team on 029 2023 9000.